After the 1973 war, many Israeli artists had tried to express their pain. Gronich had teamed up with two other talented youngsters Shem Tov Levy and Shlomo Ydov. With Gronich on keyboards, percussion and vocals, Levy on flute, keyboards percussion and vocals and Ydov on guitars, bass, percussion and vocals and with assistance from several session musicians they recorded a brilliant album under the name Ktzat Acheret ("A Little Different") or as they called themselves in English "Nonames". This album had reflected some of the pain and anguish of the Yom Kippur war and was very varied musically. The group at this stage was very influenced by groups such as Gentle Giant,Yes and The Mahavishnu Orchestra and it was reflected in their music, but they also add their own dose of Jazz, Classical Avant-garde and Middle and Far Eastern music. This album is a masterpiece of Israeli prog and is essential. After a while, the band split due to Gronich's departure to USA. 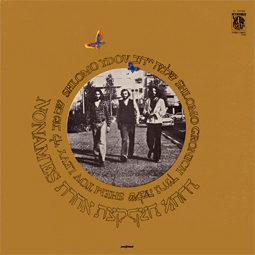 This is the new 2015 reissue of this great 70's album which considered to be maybe the best Progressive album to be recorded in Israel. This reissue on Helicon Records is loyal to the original release, remastered from the original analog recordings.